Solomon commanded that the living child be cut in two. SOLOMON WAS THEgreatest king that ever reigned in Israel; he was also one of the wisest men that ever lived. When he first came to the throne, God appeared to him one night in a dream, and asked what gift He should bestow upon him. Solomon prayed that He would give him wisdom to govern his people. God was pleased that he had asked wisdom instead of riches, or conquests, or long life, and He told Solomon that because he had done so, not only would He make him wiser than any man who ever lived, but that he should be rich and famous above all kings of the earth. And if he would obey Him in all things, long life should also be added to the other good gifts which were to be his. In those days it was the custom for kings to sit in some public place, where such of their subjects as had wrongs to complain of might plead their cause before them, and obtain justice. One day two women came before Solomon. One of them told him that she and the other woman both lived in one house, and each had a very young child; that in the night the child belonging to the other woman died, and its mother exchanged it for the living one, putting her own dead child in her neighbor’s bed as she lay sleeping, and taking the living child to herself. In the morning, the mother of the living child found out the cheat; but she whose child was dead would not give up the one that she had stolen, for she said it was her own. And the two women stood there before the king, each one contending that the living child was hers, and that the dead child belonged to the other. 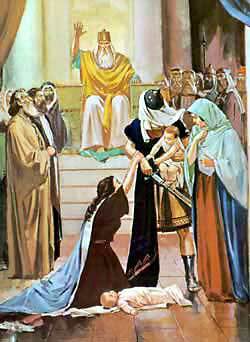 Then Solomon desired his people to bring him a sword; and when it was brought, he bade them divide the living child in two, and give half of him to each of the women. And all the people of Israel, when they heard of this judgment of Solomon, knew that God had indeed given him wisdom to do justice among his subjects; and they held him in great awe and reverence.